Herbivore (San Francisco, CA) – eat.drink.craft. A disclaimer: I do not adhere to a vegan diet. Herbivore is a vegan restaurant that serves breakfast, lunch, and dinner, everyday, at all three of their locations. I would not have sought the place out myself, if it weren’t for a vegetarian friend who recommended me their breakfast. I told a vegan friend that I was going there and he recommended AGAINST their breakfast, and instructed me to go for any other meal. I got there around 11:30am and was left at a dilemma. It was the perfect time for both breakfast and lunch and I flip-flopped between the basil pesto tofu scramble or a falafel wrap. As you can see, I decided on breakfast. The homestyle potatoes were seasoned very well. Most breakfast diners don’t season their potatoes, letting their customers salt-and-pepper the heck out of them. The toast was good, despite there being no butter/margarine/Earth’s Balance (yes, I know WHY there wasn’t butter). Granted, maybe it was too lightly spread for me to notice. The JAM, though, my goodness, I would eat that jam any day! My biggest problem was the tofu scramble. I like my tofu scramble to be firm and chunky. 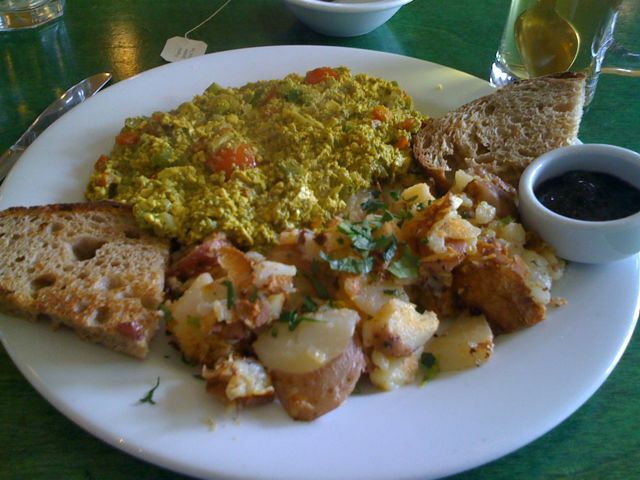 Herbivore’s tofu scramble was a runny mess, which I think works well if you wanted to dip the toast in. Actually, in retrospect, that’s probably the intention. Aside from the texture, though, the flavor of the scramble was not bad, but it wasn’t great either. After a cursory glance at their menu, I feel that lunch or dinner would be more appealing to a meat-eater. Breakfast would probably be more appetizing if you don’t already have pre-conceived, non-vegan notions of what breakfast “should” be like. (I kept thinking about how delicious bacon would be dipped in the scramble.) So if you’re non-vegan like me, I’d suggest going for lunch or dinner. On a slight side note: I do love the breakfast at Pokez, in Downtown San Diego. Mm, their vegan machaca is delicious! This entry was posted in eat and tagged breakfast, vegan. Bookmark the permalink.